Last night I was at Marshalls. Marshalls is one of those stores where you can get brand names for less. I was looking for a new handbag. I like the little one that I've been carrying around all this while but with my cell phone in it, sometimes I can hardly zip up the thing! So I thought I'd get myself a new handbag if I see one that is neither too small nor too large. I finally settled on one by Etienne Aigner. The name means nothing to me! Heheheh, never heard of it before! This morning I saw this ad on TV. 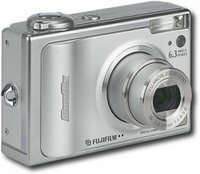 It was for a Fujifilm digital camera. Since I got myself a new handbag yesterday that could fit more things, I thought I'd get myself an ultra compact digital camera that could fit easily into my new handbag. Then every time I see something worth taking, I'd have my camera handy. So much for an ultra compact digital camera! :-) For $30 more I could get the next highest model which could do a better job at taking close up pictures! So I went for the slightly higher end model instead of the ultra compact one. Hey, I have plenty of room in my new handbag! Call these two items my early birthday presents! My birthday is on the 3rd of next month.